In 1993 two local women, Margaret Morrissey and Annie Hoagland, had a special vision for the River bluff area in Alton and Godfrey. Wanting the land along the bluffs to be preserved for future generations, they tried to persuade area landowners to enter into legal agreements to preserve their land, but they were unsuccessful until the Provincial Council of the Oblates agreed. Then other landowners also signed on! Father Lou Studer was on the Council at the time, and he remembers this visit and their follow-up letter campaign. He also remembers that the Council agreeing unanimously to dedicate 16 acres as an Illinois Nature Preserve! These acres is now named the Missionary Oblates Woods Nature Preserve. “More Important Now Than Ever” was the theme of our celebration. In the past 25 years more land has been developed and forests have continued to degrade; so, preserving high quality forested area has only increased in importance. It was truly visionary to begin preserving as much forested area as possible twenty-five years ago. 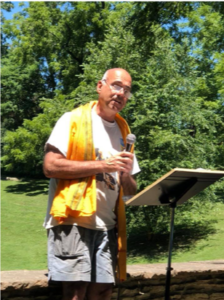 The celebration was held on Saturday, July 7th outdoors from 2:00 – 4:00 pm and was attended by over 40 people, including Mayor Mike McCormick, representatives of the Illinois Nature Preserves Commission and the Great Rivers Land Trust, faithful Preserve volunteers, friends and the Novitiate Community. The program included a luncheon for special guests, several presentations and a guided hike into the Preserve. 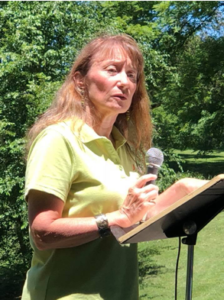 Pen Daubach, an Illinois Nature Preserves Commissioner, who highlighted the name “Oblate” as “one who offers”, saying that the Oblates have made a big commitment in offering their land to protect biodiversity and to preserve habitat. justice, peace and integrity of creation priority, sharing this aspect of the Oblate spirit. 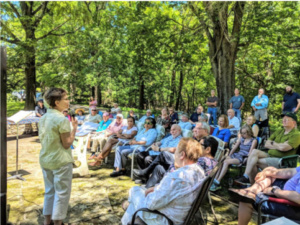 Maxine Pohlman, SSND, who works with the Preserve volunteers, said that it was the work of this group of highly dedicated people who healed the acres by removing trash, invasive species, and planting native wildflowers. “They work hard, meeting monthly, to tackle a job that looked impossible, but the volunteers have made a huge difference in a few years.” For several years OMI novices have taken part in Preserve work, putting up boundary markers, removing honeysuckle, and participating in controlled burns. After the presentations, the hike into the Preserve was a real eye-opener for participants who got to experience firsthand what land can look like when it is maintained by people who have learned to do the task correctly. A clear view of the River, the presence of native wildflowers, and the absence of big honeysuckle bushes and invasive trees make the Preserve a beautiful example of what protected land can look like and how it can serve the community of life in this region. 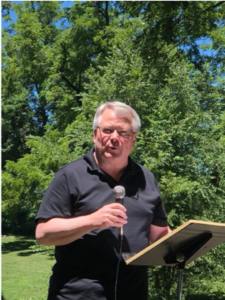 Everyone took away with them a good share of Oblate spirit, esteem for the work of the Illinois Nature Preserves Commission, and the peace that comes with spending time in a beautiful place.